Phew….this has been a crazy time. For someone who just works at home making cute little diy things, has kids and cleans….i sure have been busy. Probably doesn’t help that it’s the end of the school year and things always get crazy around the end of the year. I have been getting orders done here and there and have recently finished my second book…..currently being edited….this is the worst part lol. This first project was a baby car set cover. She wanted one that had sheep on it! Ask and I will do it. This little guy is the cover to my second book! I am so excited. A few friends and I are getting together and working on Baby shower gift baskets. This is a work in progress needless to say. They are going to be able to be custom ordered with items from 4 of us. We have one girl who makes the softest blankets, burp rags and she is working on a few new items. Another makes personalized onsies and funny shelf sitters. Another friend sells young living items that are chemical free baby items. Lastly me. I work on all the crochet items. Pictured is my baby teether toy, stuffed animal and basket. There are going to be so many things for you to choose from to make your basket one of a kind I just can’t wait to show all of you! Stay tuned or contact me today with any questions you have. These are not up for sale yet but we can begin to take orders. These will be made to order so make sure you give us a few weeks notice. This is yet another Order!!! I am currently working on a bulk order for Christmas. Yep you heard right. 6 different stuffed animals for all 6 grand babies. This one is number 2 of 6. I can’t wait to get these all done and delivered. Finally, this was a little something i felt my bathroom needed. I got so tired of seeing that ugly tissue box in my bathroom and honestly I HATE those tissue box covers. So here we are. I am done….we writing for the moment. With so much going on sometimes I feel like I am non-stop while other times I feel like all I do is sit around all day. Any other stay at home moms feel that way? The good news….i got most of my house scrubbed this week, and all of these projects done. The other news….haven’t figured out if its good or bad….the girls will be out of school soon and we will be even busier! Years ago I was talking to my dad and telling him about all the wonderful stomach pains I had been having. He then let me know that he was lactose intolerant and thought I may need to test some things to see if that’s what was bothering me. I started paying attention to what i ate before my stomach started bothering me and it seemed that it was every time I ate cheese, milk, yogurt, ice cream and pizza….yep it looked like dairy was bothering me. My first step was to buy some chew-able Lactaid tablets. I spent two weeks not eating any dairy at all and then when I did the first time ate a pill…..no problems. The next time I skipped the pill and the horrible stomach cramps followed by some time on the toilet ensued. Ok pretty sure at this point I was lactose intolerant. There are a few tests that a doctor can do but for the most part it is trial and error. I have found that the chew-able tablets work better than the caplets…..although sometimes its hard to choke down because they are a strong vanilla flavor. Moving on. When I first figured out Lactose was a problem there wasn’t much out on the market like there is today. The pills were about your only option. As time went on though more companies began to realize that this was a BIG problem. In the past it was rare for people to have this issue but as time passes more and more people are having issues with lactose. 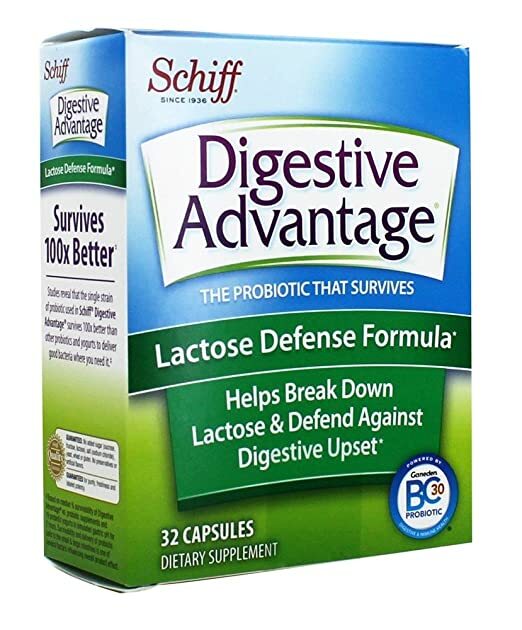 I then ran into Digestive advantage and it is amazing! I don’t remember how you begin these pills but I believe for a week you don’t eat any dairy and you take 2 of these a day then on your second week you can eat dairy and only take one a day from then on. These allowed me to tolerate small amounts of lactose without the pain and issues as before. I could have a slice of pizza without a problem…..however I could NOT have 5 scoops of ice cream…..over did it that time! But for the record I was really excited. Here is where life goes from better to amazing! Another company researched the lactose problem and decided that although Lactaid had come out with milk, cottage cheese, ice cream and a number of other product that are lactose free those items are also expensive. So they developed drops that you drop into your milk, sour cream, cream cheese and heavy creams and in 24 hours the drops breakdown the lactose in the dairy to simple sugars that your body can digest easily without the pain and suffering. All of these items can be ordered from Amazon. The pills can be bought at Wal-Mart and other grocery stores but so far the drops i have had to order. We put one dropper full in our gallon of milk a week and none of us have any problems. The drops last for a good 3-4 months and are usually between 11-13 dollars. 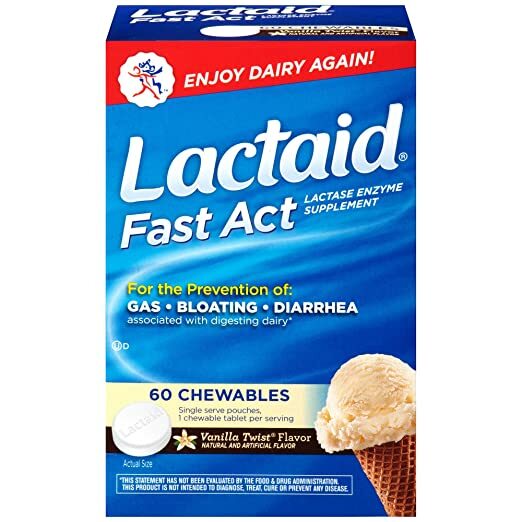 The Lactaid milk can be 5 dollars for 3/4 gallon. I started doing the drops because i was tired of spending so much on milk when i didn’t have to. Once I began doing the drops I started making cheeses and ice creams. Those recipes can be found in my blog in the lactose free area. It really all just depends how much effort you want to put into things. I personally don’t like taking pills so I opted for the drops when we found out about them. Good luck and if you have any questions please don’t hesitate to ask. I have had this problem for about 20 years now. I am sure there are a lot of people who know more than me about this issue but it took me forever to find the information. I wanted to come on here and give you what I had in one place. I will also come in and update this if someone asks a question and i think it needs to be discussed more in length. This is one of those dinners that we have to limit considering my family is lactose intolerant! So when we do have it everyone is beyond happy. A few years back I started being lazy/smart with how i made my lasagna. It is such a pain trying to paint ricotta cheese on a limp noodle. So bare with me this is easier and comes out amazing. In a large pot saute your onion and garlic together until onions are transparent. Add in your meat, 1 tsp salt, 1 tsp pepper, 2 tbl garlic and herb seasoning and brown. Add in your sauce stir together then set aside. In a large bowl combine your Ricotta cheese and 75% of your Mozzarella set aside. Now spray your glass baking dish, i always make 2 lasagna’s when I make them and put one in the freeze for next time. Take your uncooked noodles and place 3 in the bottom, spread your cheese mixture on top. Pour some meat sauce on top of that then lay 6 pieces of provolone. Continuing to layer like this minus the provolone (only 1 layer of provolone per lasagna). When you are done layering add on top your plain mozzarella. Cover with foil and place in the oven at 350 for 1 hour. Take the foil off of the top and continue cooking for another 20 minutes. If your cheese is not browned put your oven on broil and watch it brown. If you save the 2nd lasagna wait until it is completely cool. Cover with saran wrap then foil. It will be good for 2 weeks in your freezer this way. Comment on the post and share! Good luck to everyone. It’s that time again GIVEAWAY time! I keep racking my brain on what to giveaway this time around an I have decided to leave in your hands! So for this giveaway I am going to offer different things. In the comments below tell me what you want to win! 1.Comment below to tell me what you want to win. It’s so easy to get wrapped up in everything we are doing from making sure the kids get off to school to working and of course cleaning the house that never seems to stay clean that we forget to plan dinner. And honestly we run out of ideas for dinner! Half the time I make my kids help me plan for the weekly dinner menu because i am just out of ideas on what to cook. So here’s an easy one. This takes all of five minutes to throw together so all you have to do is buy the ingredients. Brown your ground beef and then season with your taco seasoning by following the seasoning directions. In a 9×13 glass baking dish, layer your chips, meat, refried beas, salsa. I usually do 2 layers of each ingredient. On top place a nice layer of your cheese and throw it in the over on 350 for 10 minutes. Done! Dinner i on the table, everyone is happy, people have had vegetables. On a night where it just seems like you are chasing your tail this is a crowd pleaser. I have also been known to do black beans instead of re-fried and add avocados. This was my first book that I sat down and wrote. It took quite a while to get the idea put down on paper/computer and I self published with createspace through amazon. I edited edited and edited some more before i handed it over to a few of my friends to edit it for me and tell me what they thought. I was so nervous to hand that book over to friends, scared of what they might think when they read it and worried it wasn’t as good as i hoped it was. For the most part I have had outstanding reviews and i absolutely love hearing from people who have read it and have questions! I left this book open at the end in order to write a follow up. All the Lost Souls has been up for sale on Amazon for over a year and I am currently working on the second book called All the Lost Answers. So many unanswered questions from book 1 will be answered soon! While I still have a bit to write (and then the editing quest will begin) I can not wait for people to read the second one and tell me what they think of my two books as a whole. The thing is with writing this book, this blog, crocheting, wood burning, taking care of my house and family I sometimes wonder how much I am going to try to do in my lifetime. Does it ever feel like you are being pulled in twenty different directions and the only person who is causing it is yourself? I wish I could say that I didn’t enjoy one of these many hobbies I have taken on so that I could easily step away from it and Master 1 thing but I love them. I am have multiple pots boiling all at once and I wouldn’t want it any other way! So what do I hope to achieve by writing the books? I just like telling a story. I like entertaining and more than anything I like making people smile. Don’t get me wrong I don’t want to be a people pleaser or anything but I do enjoy being a part of someones day that makes them smile. I feel that more people need to go through their day trying not to be the bad part in someones day. Maybe if a few more did this it would be a better world. So while I try to take on the world by doing everything possible what will you try? About a year ago a friend said “Can you make” and that is how RainyDayComforts was started. Keep in mind I was also in the middle of writing book! It turned into the thing i never knew I wanted. I love making people their one of a kind gifts that they can’t just go to a store and grab. When they go to a baby shower or birthday party they never have to worry about someone else having the same item. Does it keep me busy…you bet! But i have to say i love every minute of it and I am so thankful to each and every one of my friends, family and new customers who have ordered from me. I started this blog because I wanted to make things myself to save money. Not only have I done that but I have also found a way to bring in a little extra cash. You might be wondering what I make. I crochet and I can make just about anything. As long as I can find a pattern I am good. I have also written a few patterns. I wood burn and have done a lot of customized cutting boards with peoples last names or Home sweet home on them. I have done a few with Grandma’s famous recipe’s on them and you should have seen the face of the person who got it. I am just so happy to be part of people’s happiness. I am selling on Etsy and Facebook and I take special orders.